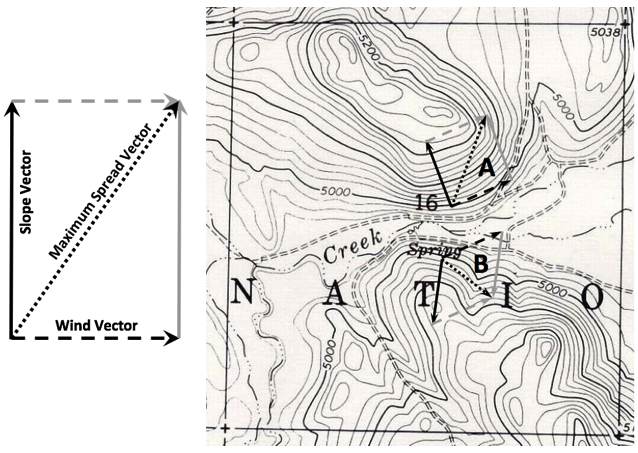 Projecting fire spread with cross slope winds utilizes a vectoring process, where the effect of wind and the effect of slope on Rate of Spread (ROS) may be represented by separate vectors that represent both a magnitude and a direction. The resultant vector represents both a direction and magnitude of maximum spread in that direction. Slope Vector is drawn directly upslope and estimated by calculating ROS with the estimated slope steepness and Zero (0) windspeed for inputs. Wind Vector is drawn in the direction of the wind and estimated by calculating ROS with the estimated windspeed and Zero (0) slope. Maximum Spread Vector can be drawn as shown and measured to determine the resultant ROS and spread direction. In example A here, wind is crossing more upslope, resulting in an enhanced maximum ROS. In example B, wind is crossing more downslope, resulting in a reduced maximum ROS. With winds blowing downslope (±30°), the difference between the spread rates is the resulting ROS using the direction from the larger vector. ROS is determined from the measured maximum spread vector (spread distance) and the time period used to obtain wind and slope vector estimates. Heat Per Unit Area (H/A) is the same for all component vectors. Fireline intensity (FLI) and flame length (FL) can be calculated from ROS and Heat Per Unit Area (HPA) using these calculations.